Sure, a lot of people think Jewish people run Hollywood, and... they'd be totally right! But where do they eat? 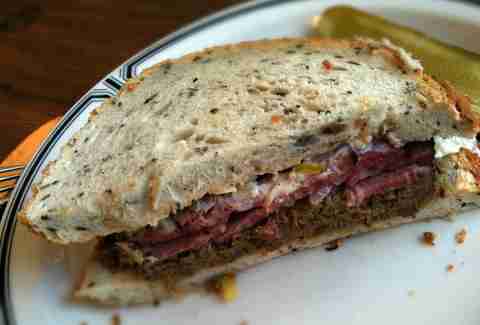 The 10 best Jewish delis in LA, which you can read about right here. The lowdown: Generations of Angelenos have gone meshuggunah for this old-school deli, which, for 60+ years, has been run by a single family that serves knishes and kosher dogs to everyone from Kareem Abdul-Jabbar to Schwarzenegger to, uh, you. 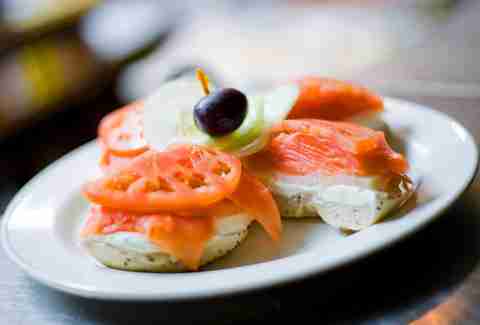 What you're gonna get: Their lox and cream cheese bagel is perfectly stacked -- just see above. What else you're gonna get: Matzo ball soup. The lowdown: If you want super good Jewish food and're thinking about going to Jerry's, don't (... unless you've just finished bowling, obviously). Hit this smaller, low-key deli instead. They've been blasting Valley kids with carbs since 1957, which means they've perfected everything from noodle kugel to sky-high pastrami sandwiches. What you're gonna get: One of those sky-high sandwiches. The lowdown: Definitely the weirdest location of any of LA's best Jewish delis, Langer's has been next to MacArthur Park since 1947, and there're people who've probably been waiting in their line nearly that long, too. 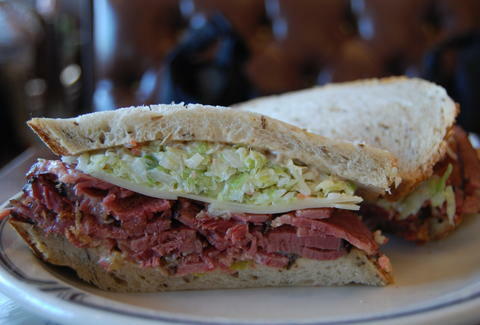 It snakes around the block, thanks in huge part to the #19, a pastrami and coleslaw monster that's not just one of the best sandwiches in the city -- it's been called one of the best in the country, too. What you're gonna get: You're definitely getting the #19. There's no question. The lowdown: The perennial, 24-hour favorite on Fairfax has been around nearly as long as its octogenarian servers, and was once known as much for its pastrami as it was for being the hang out spot for Guns N' Roses (owner Marc Canter even wrote a book about the band's early days based on his experiences with them). Pro tip: if you're, uh, chemically addled, their crazy ceiling will either be the best thing ever, or you'll think it's gonna kill you. 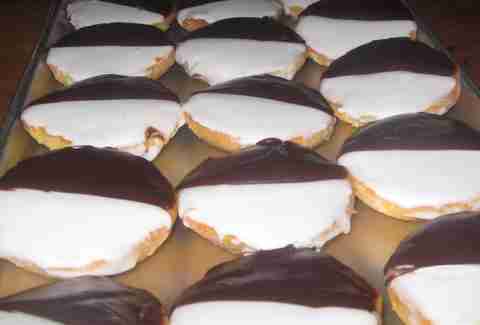 What you're gonna get: Black & white cookies (which aren't even actually cookies?!?!?!?) from their extensive bakery selection. 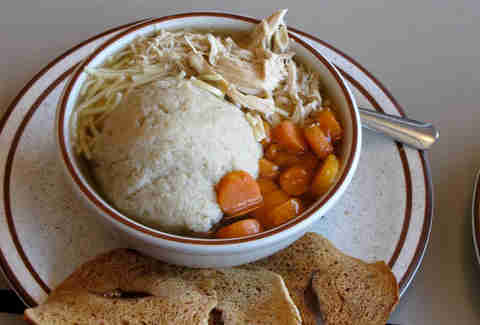 What else you're gonna get: Chicken turkey soup Matzo ball soup. The lowdown: Since 1948, Billy's has been chucking cured-meatwitches and burgers to locals, but they're also well-known for the "wall of food" on the outside; it's a tasty lookin' modern art piece made from "ceramic, hand-sculpted blocks of cheese, bread loaves, sticks of salami, and wine casks". What you're gonna get: The Rueben. Is it special-er than any other Rueben? No, not really. But it's at Billy's. So it's great. The lowdown: Owned by the same family since the '60s, Brent's recently opened a second location in Westlake Village, giving two different neighborhoods the gift of cheese blintzes and stuffed kishka -- which they deliver all over SoCal. Mazel! 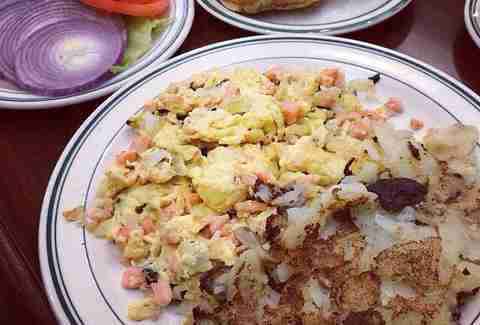 The lowdown: This massive West LA landmark's been there since 1948, and has been run by the same family since 1969. It's got an enormous menu to go with its huge space, with everything from a daily sausage (hahaha) to chicken fajitas to stir fry, along with all the usual deli offerings. 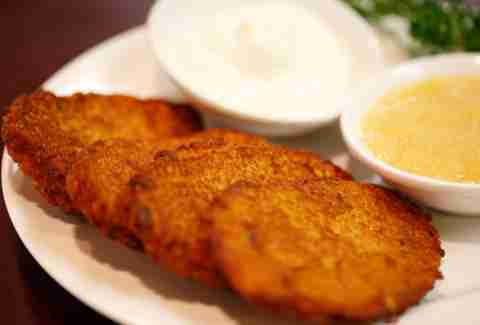 What you're gonna get: No matter what, get a side of latkes (or for the uninitiated: potato pancakes). What else you're gonna get: Mazto ball sandwich. J/K, J/K, get the soup. The lowdown: Not just one of LA's oldest delis, but also one of the city's oldest restaurants, Greenblatt's has been on the Sunset Strip since the goddamn '20s. 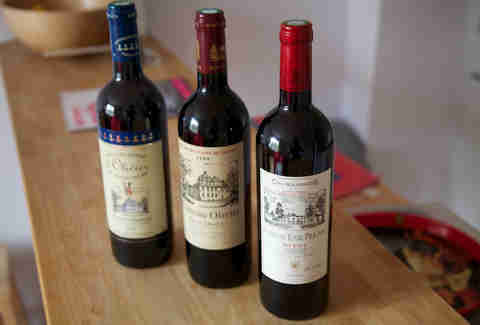 The shop's not only known for its excellent deli case, but also a huge -- and great -- wine shop. What you're gonna get: Definitely some wine. And maybe the rare roast beef. What else you're gonna get: Matzo... ball... soup. The lowdown: Though it's unclear what makes this deli more "Chicago-style" than "New York-style" (which they say it is), it doesn't matter, 'cause the food at Label's is totally great, no matter which ridiculously freezing city they claim to be influenced by. 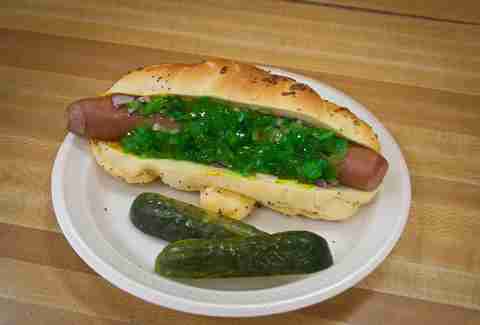 What you're gonna get: If you're hard up for money, this Vienna beef dog's under $5. What else you're gonna get: Seriously? We have to keep doing this? The lowdown: This newcomer to the deli scene opened in the former location of the beloved schmaltz-shop Junior's, and is continuing their legacy with killer sandwiches, and, of course, all-day breakfast. 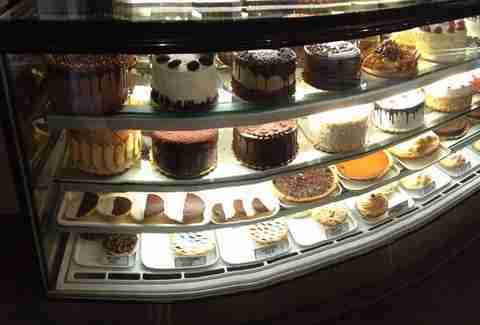 What you're gonna get: No matter what, you're getting dessert -- their case has a ridiculous amount of fresh, amazing cakes. What else you're gonna get: Dude. Matzo ball soup. Jeff Miller is the Jewish Editor of Thrillist LA, and eats a LOT of matzo ball soup. You can hit him up on the tweets at @thrillistla and on the Instas at @jeffmillerla.